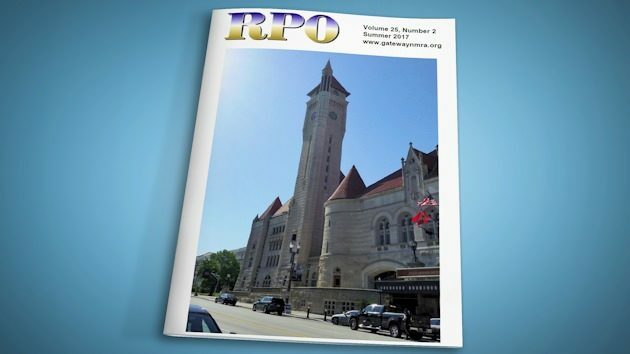 The Summer 2017 quarterly members newsletter of the Gateway Division NMRA, The RPO, is now available online in PDF (Adobe Acrobat) format. The RPO, Vol 25, No 2, Summer 2017 (pdf 4.37MB). This 40-page issue includes the “Superintendent’s Desk” by Jim Ables, “Under the Wire” by John Carty, “Director’s Reflections” by Jon Marx, “Tour of St. Louis Union Station and Hotel” by Ron Gawedzinski, “NMRA Joint Regional Convention May 18-21 Ames, IA” by David C. Lowell, “Static Grass” by Gregor Moe, “St. Louis RPM Meet June 23 & 24, 2017” by David C. Lowell, “Pete Smith’s Loon Lake & Navigation Co.” by John Carty, “MCoR is now on Facebook” by Robert A. Simmons, “Division Minutes” by Gregor Moe, “Timetable of Events,” and cover photo by Ron Gawedzinski. Edited by John Carty.